Frames are normally included with original paintings. Oil frames will be Pleinaire (solid gold) unless labeled traditional. They will be similar to the examples below. If you would like a different style or no frame at all please contact the artist. 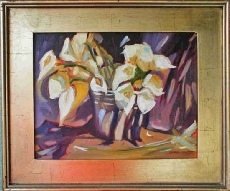 All paintings may be purchased without frames and the price will be reduced by the cost of the frame and framing. I have been doing some paintings on Gallery frames where the painting continues around the edges so they are suitable for hanging without frames. Prints can be framed if desired. 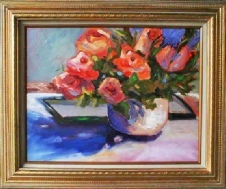 Frame price depends on the size and type requested and will generally be the artist’s cost plus a small handling fee. Please ask before ordering. Shipping will always be less for an unframed painting or print so it may be more economical for you to get a frame locally. 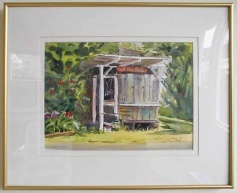 Watercolors are framed with gold metal, plexiglas and off white mats about 4” wide as shown.